Combine all the marinade ingredients in bowl. Place the goose in a large roasting pan. Rub the marinade all over the goose massaging into the skin on both sides. Cover with the coarse sea salt and place in the fridge for 12-24 hours, uncovered. Preheat oven to 325 degrees. 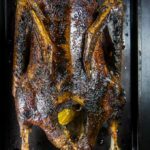 Place the goose on a roasting rack, breast side down, and roast for 1 hour. Drain excess fat from the pan and reserve. Flip the goose over and roast another hour. Drain excess fat from the pan and reserve. Turn the heat up to 400 degrees and brush the goose with half of the honey glaze. Cook for 15 minutes. Baste again with remaining honey mixture and cook another 15-20 minutes, or until the temperature of the goose reads 160 degrees. Remove and let rest for 15 minutes. Temperature will rise to 165 degrees while the goose is resting. Combine all ingredients in a saucepan and heat until honey is dissolved. You can substitute dry sherry for the Shaoxing wine. If it seems like a lot of salt, that's ok. The salt is what brings the moisture out of the goose so the skin crisps up. It also adds great flavor. It is important to leave the salt rub on overnight as it helps to dry out the skin. A drier skin will become crispy when roasted. For a stronger orange flavor, add 1/2 tsp. of orange zest to the honey glaze. DO NOT THROW AWAY THE RESERVED GOOSE FAT. It can be used in many different recipes and offers an amazingly rich flavor. Roast the meat until the internal temperature reaches 160 degrees. The temperature will continue to rise to 165 degrees while resting. Flipping the goose while roasting keeps the breast meat from drying out. To freeze: Carve the meat off the goose carcass and place in a freezer safe container or freezer bag. Store in the freezer for up to 3 months. Thaw in the fridge overnight and reheat in the microwave or place in a 350 degree oven for 10 minutes until warmed through. Can also be reheated in a skillet over medium heat. Add a touch of reserved goose fat to the meat to prevent it from drying out while reheating. Reserve the goose carcass to make goose stock or bone broth.